Dice-bob Square-House! This bloglet plays a littlemuch better if you hum a certain tune to it. The origin of the Square House is that we were at GenCon exposing people to Spellbooks and dice trays and such, and one of the booth attendees bet us a free set of polyhedral copper dice that he could fit them inside of our tiny treasure chests. We did not believe. So foolish. 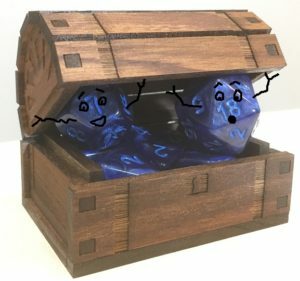 Now treasure chests are also dice boxes!